Lather, V., et al. Synthesis, Docking and Anti-inflammatory Activity of Some Newer Triazole Derivatives as Potential PDE7 Inhibitors. (2017) J Med Chem Toxicol 2(2): 55- 61. © 2017 Lather, V. This is an Open access article distributed under the terms of Creative Commons Attribution 4.0 International License. Phosphodiesterase 7 (PDE7), one of the members of PDE family has been reported as potential therapeutic target involved in inflammation. The present work was designed to synthesize and evaluate the anti-inflammatory activity of some newer substituted triazole derivatives as potential PDE7 inhibitors. 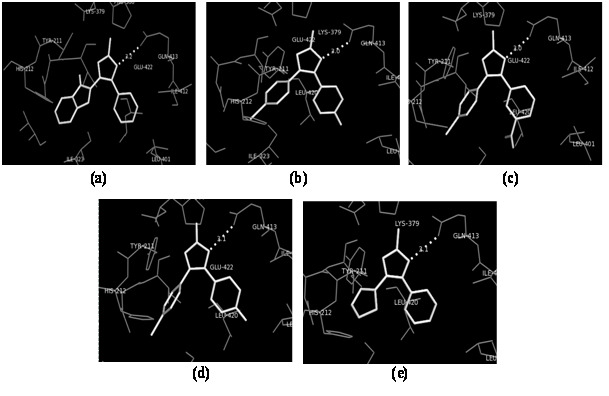 A series of substituted triazole derivatives was synthesized and evaluated by in silico studies to determine the binding interactions for the best-fit conformations in the binding site of the PDE7 protein. The selected compounds from in silico studies were evaluated further for their anti-inflammatory activity in the animal models. Amongst the synthesized molecules, compound 3 showed higher anti-inflammatory activity. The in vivo results showed accordance to that of in silico results. Most of the synthesized molecules were found to have drug-like properties as devised by Lipinski’s rule of five. These molecules can act as the starting hits for the design of safe, effective and orally bioavailable PDE7 inhibitors for the treatment of various inflammatory disorders. Phosphodiesterases (PDEs) are a diverse family of enzymes that catalyze the hydrolysis of the cyclic nucleotides adenosine 3′, 5′-cyclic monophosphate (cAMP) and guanosine 3′, 5′-cyclic monophosphate (cGMP) to inactive 5′ - nucleotide metabolites and thus play a major role in regulating intracellular levels of cyclic nucleotides. PDE isoforms are grouped into 11 families and differ in substrate specificity, affinity, tissue distribution and regulatory mechanisms[1,2]. PDE7 is a cAMP-specific enzyme which catalyzes hydrolysis of cAMP into adenosine monophosphate and is widely expressed both on lymphocytes and in certain brain regions and involved in pro-inflammatory processes[2,3]. Intracellular secondary messenger, cAMP regulates many biological responses in humans like inflammation, lipid metabolism, and apoptosis. cAMP is believed to help in maintaining immune homeostasis by promoting the release of anti-inflammatory mediators and suppressing the release of proinflammatory mediators by immune cells[4,5]. A wide range of anti-inflammatory effects such as decreased proliferative response, decreased pro-inflammatory cytokine production, and decreased surface marker expression in leukocytes can be achieved through elevation of intracellular cAMP levels. The inflammatory disorders such as asthma and chronic obstructive pulmonary disease are treated by increasing cAMP levels[6,7]. PDE7 inhibition leads to increased levels of cAMP resulting in decreased edema, cellular inflammation, mucous secretion and bronchoconstriction. Efficacy of PDE7 inhibitors as anti-inflammatory agents in animal models has been reported recently and represents a new class of drugs for the treatment of inflammatory disorders[8,9]. The only commercially available PDE7 inhibitor is BRL50481 (3-(N,N-dimethylsulfonamido)-4-methyl-nitrobenzene) discovered in 2004[10,11]. In last few years, a wide variety of heterocyclic molecules including benzothieno-thiadiazines, quinazoline derivatives, thiadiazole derivatives, purine derivatives, pyrimidine derivatives, pyrimidones, furan derivatives and dihydronaphthyridinediones have been reported as potential PDE7 inhibitors. Recognizing the potential role of heterocyclic compounds in wide therapeutic areas including inflammation and consideration of thiadiazole derivatives as selective PDE inhibitors, we have planned to synthesize some newer substituted triazole derivatives as potential PDE7 inhibitors and evaluation of their anti-inflammatory activity. All the chemicals were purchased from Spectrochem Ltd., HiMedia Laboratories, SD Fine Chem. Ltd., and Otto Chem. Pvt. Ltd., etc. and were used for the experiments. Melting points were determined in open capillary tubes on a Veego VMP-D melting point apparatus. The reaction completion was monitored by Thin Layer Chromatography (TLC) on Silica Gel Plates (Silica Gel-G) and the purity of the compounds was ascertained by single spot on TLC plate.1H Nuclear Magnetic Resonance (1H-NMR) spectra were recorded on Bruker Avance II 300 MHz NMR spectrophotometer using appropriate deuterated solvents and are expressed in parts per million (&del ppm) down field from tetramethylsilane (internal standard). Infra Red (IR) spectra were recorded on a Shimadzu IR affinity FT-IR spectrophotometer using KBr pellets. 2-(7-Aza-1H-benzotriazole-1-yl)-1,1,3,3-tetramethyluronium hexafluorophosphate (HATU) or 2-(2-(1H-benzotriazol-1-yl)-1,1,3,3-tetramethyluronium hexaﬂuorophosphate (HBTU) (3.1 mmol) and the aromatic acids (2.8 mmol) were added in a flask containing dimethylformamide (DMF) (10 ml) and N,N-diisopropylethylamine (DIPEA) (8.3 mmol) with stirring and followed by addition of amidine (4.2 mmol). The reaction mixture was stirred at room temperature and monitored by TLC for consumption of acid and formation of acylamidine intermediates. After 3 hrs, respective hydrazine hydrochlorides (4.2 mmol) were added to the reaction mixture followed by addition of acetic acid (27.7 mmol) and the reaction mixture was heated to 80°C and monitored by TLC for consumption of acylamidine intermediate. After 3 hrs, the reaction mixture was cooled to room temperature, diluted with ethyl acetate (200 ml) and extracted with a saturated solution of sodium bicarbonate (200 ml). Organic layer was dried over magnesium sulphate, filtered and concentrated. The crude products were purified and recrystallized with ethanols. 2-[1-(4-bromophenyl)-3-methyl-1H-1,2,4-triazol-5-yl]-1H-indole (1): M.P. (°C): 138-140; Yield: 55%; IR (KBr Pellets) ν cm-1: 1654.92 (C=N str., aromatic), 1064.71 (C-N str., aromatic), 3086.11 (C-H str., aromatic), 1579.70 (C=C str., aromatic), 1228.66 (N-N str., aromatic), 1392.61 (CH3 Bend), 561.29 (Br-C6 H5, str., aromatic); 1H NMR (δ ppm, DMSO): 9.75 (s, 1H, NH of indole ring), 7.16 (d, 2H, CH of C2 and C6 of C6H5-Br), 6.07 (s, 1H, CH of C9 of indole ring), 7.53 - 7.55 (d, 2H, CH of C3 and C5 of C6H5-Br), 7.79 - 7.82 (m, 4H, Phenyl ring of indole), 3.39 (s, 3H of CH3). 2-(3-methyl-1-phenyl-1H-1,2,4-triazol-5-yl)-1H-indole (2): M.P. (°C): 140 - 142; Yield: 48%; IR (KBr Pellets) ν cm-1: 1666.50(C=N str., aromatic), 1078.21 (C-N str., aromatic), 3059.10 (C-H str., aromatic), 1589.34 (C=C str., aromatic), 1269.16 (N-N str., aromatic), 1382.96 (CH3 Bend). 1-(4-bromophenyl)-5-(4-fluorophenyl)-3-methyl-1H-1,2,4-triazole (3): M.P. (°C): 128 - 131; Yield: 62%; IR (KBr Pellets) ν cm-1: 1653.00 (C=N str., aromatic), 1018.14 (C-N str., aromatic), 3057.17 (C-H str., aromatic), 1595.13 (C=C str., aromatic), 1274.95 (N-N str., aromatic), 1392.61 (CH3 Bend), 1126.43 (FC6H5, str., aromatic), 565.14 (Br-C6H5, str., aromatic). 1-(4-bromophenyl)-5-(furan-2-yl)-3-methyl-1H-1,2,4-triazole (4): M.P. (°C): 138 - 140; Yield: 52%; IR (KBr Pellets) ν cm-1: 1672.28(C=N str., aromatic), 1066.64 (C-N str., aromatic), 3078.39 (C-H str., aromatic), 1591.27 (C=C str., aromatic), 1284.59 (N-N str., aromatic), 1381.03 (CH3 Bend), 1109.07 (C-O str., aromatic), 586.36 (Br-C6 H5, str., aromatic); 1H NMR (δ ppm, DMSO): 7.96 (d, 1H, CH of C3 of furan ring), 7.25 - 7.36 (d, 2H, CH of C2 and C6 of C6H5-Br), 6.68 (t, 1H, CH of C4 of furan ring), 7.83 (d, 2H, CH of C3 and C5 of C6H5-Br), 6.66 (d, 1H, CH of C5 of furan ring), 3.33 (s, 3H of CH3). 1-(4-bromophenyl)-3-methyl-5-(3-nitrophenyl)-1H-1,2,4-triazole (5): M.P. (°C): 140 - 142; Yield: 55%; IR (KBr Pellets) ν cm-1: 1672.28(C=N str., aromatic), 1070.49 (C-N str., aromatic), 3076.46 (C-H str., aromatic), 1593.20 (C=C str., aromatic), 1288.45 (N-N str., aromatic), 1382.96 (CH3 Bend), 1382.96 (NO2 asym. str., aromatic), 1485.19 (NO2 sym. str., aromatic), 565.14 (Br-C6H5, str., aromatic). 1,5-bis(4-bromophenyl)-3-methyl-1H-1,2,4-triazole (6): M.P. (°C): 126 - 129; Yield: 65%; IR (KBr Pellets) ν cm-1: 1660.71 (C=N str., aromatic), 1089.78 (C-N str., aromatic), 3016.67 (C-H str., aromatic), 1593.20 (C=C str., aromatic), 1274.95 (N-N str., aromatic), 1375.25 (CH3 Bend), 559.36 (Br-C6H5, str., aromatic). 1-(4-bromophenyl)-5-(4-chlorobenzyl)-3-methyl-1H-1,2,4-triazole (7): M.P. (°C): 137 - 140; Yield: 52%; IR (KBr Pellets) ν cm-1: 1666.50 (C=N str., aromatic), 1033.85 (C-N str., aromatic), 3076.46 (C-H str., aromatic), 1593.20 (C=C str., aromatic), 1485.19 (CH2 Bend),1288.43 (N-N str., aromatic), 1382.96 (CH3 Bend), 605.65 (Br-C6H5, str., aromatic), 709.80 (Cl-C6H5, str., aromatic). 5-benzyl-1-(4-fluorophenyl)-3-methyl-1H-1,2,4-triazole (8): M.P. (°C): 129-132; Yield: 45%; IR (KBr Pellets) ν cm-1: 1662.64 (C=N str., aromatic), 1078.21 (C-N str., aromatic), 3080.32 (C-H str., aromatic), 1579.70 (C=C str., aromatic), 1435.04 (CH2 Bend),1168.86 (N-N str., aromatic), 1377.17 (CH3 Bend), 1109.07 (F-C6H5, str., aromatic). 1-(4-bromophenyl)-3-methyl-5-(thiophen-2-yl)-1H-1,2,4-triazole (9): M.P. (°C): 136 - 138; Yield: 64%; IR (KBr Pellets) ν cm-1: 1666.50 (C=N str., aromatic), 1070.49 (C-N str., aromatic), 3091.89 (C-H str., aromatic), 1512.19 (C=C str., aromatic), 1147.65 (C-O str., aromatic), 1278.81 (N-N str., aromatic), 1413.82 (CH3 Bend), 572.86 (Br-C6H5, str., aromatic). 5-(4-bromophenyl)-1-(4-fluorophenyl)-3-methyl-1H-1,2,4-triazole(10): M.P. (°C): 126 - 130; Yield: 68%; IR (KBr Pellets) ν cm-1: 1666.50 (C=N str., aromatic), 1031.92 (C-N str., aromatic), 3080.32 (C-H str., aromatic), 1604.77 (C=C str., aromatic), 1215.15 (N-N str., aromatic), 1382.96 (CH3 Bend), 563.21 (Br-C6H5, str., aromatic), 1149.57 (F-C6H5, str., aromatic). 5-benzyl-1-(4-bromophenyl)-3-methyl-1H-1,2,4-triazole (11): M.P. (°C): 135 - 138; Yield: 55%; IR (KBr Pellets) ν cm-1: 1674.21 (C=N str., aromatic), 1111.00 (C-N str., aromatic), 3076.46 (C-H str., aromatic), 1591.27 (C=C str., aromatic), 1485.19 (CH2 Bend),1288.45 (N-N str., aromatic), 1382.96 (CH3 Bend), 497.63 (Br-C6H5, str., aromatic); 1H NMR (δ ppm, DMSO): 7.72 (d, 2H, CH of C2 and C6 of C6H5-Br), 7.25-7.38 (m, 5H, Phenyl ring of C6H5-CH2), 3.27-3.33 (s, 2H of CH2), 7.97 (d, 2H, CH of C3 and C5 of C6H5-Br), 2.27 (s, 3H of CH3). 5-(4-chlorobenzyl)-3-methyl-1-phenyl-1H-1,2,4-triazole (12): M.P. (°C): 128 - 130; Yield: 58%; IR (KBr Pellets) ν cm-1: 1674.21 (C=N str., aromatic), 1083.99 (C-N str., aromatic), 3061.03 (C-H str., aromatic), 1597.06 (C=C str., aromatic), 1492.90 (CH2 Bend),1232.91 (N-N str., aromatic), 1379.10 (CH3 Bend), 752.24 (Cl-C6 H5, str., aromatic). 1-(4-bromophenyl)-3-methyl-5-(4-methylphenyl)-1H-1,2,4-triazole (13): M.P. (°C): 126 - 128; Yield: 60%; IR (KBr Pellets) ν cm-1: 1674.21 (C=N str., aromatic), 1066.64 (C-N str., aromatic), 3080.32 (C-H str., aromatic), 1591.27 (C=C str., aromatic), 1286.52 (N-N str., aromatic), 1381.03 (CH3 Bend), 601.79 (Br-C6H5, str., aromatic); 1H NMR (δ ppm, DMSO): 7.82 (d, 2H, CH of C2 and C6 of C6H5-Br), 7.28 - 7.36 (d, 2H, CH of C2 and C6 of C6H5-CH3), 7.72 (d, 2H, CH of C3 and C5 of C6H5-CH3), 7.95 (d, 2H, CH of C3 and C5 of C6H5-Br), 3.32 (s, 3H of CH3). 3-methyl-1-phenyl-5-(thiophen-2-yl)-1H-1,2,4-triazole (14): M.P. (°C): 125 -128; Yield: 64%; IR (KBr Pellets) ν cm-1: 1674.21 (C=N str., aromatic), 1078.21 (C-N str., aromatic), 3061.03 (C-H str., aromatic), 1598.99 (C=C str., aromatic), 1234.44 (N-N str., aromatic), 1379.10 (CH3 Bend); 1H NMR (δ ppm, DMSO): 7.74 - 7.77 (d, 1H, CH of C3 of thiophene ring), 7.12 - 7.22 (m, 5H, CH of Phenyl ring), 6.73 (t, 1H, CH of C4 of thiophene ring), 6.68 (d, 1H, CH of C5 of thiophene ring), 3.43 (s, 3H of CH3). 5-(furan-2-yl)-3-methyl-1-phenyl-1H-1,2,4-triazole (15): M.P. (°C): 120-122; Yield: 44%; IR (KBr Pellets) ν cm-1: 1672.28 (C=N str., aromatic), 1082.07 (C-N str., aromatic), 3061.03 (C-H str., aromatic), 1600.92 (C=C str., aromatic), 1247.94 (N-N str., aromatic), 1220.94 (C-O str., aromatic), 1377.17 (CH3 Bend). Docking studies were performed for the proposed molecules in the binding site of PDE7 protein (PDB entry: 4PM0) using Auto Dock Vina and graphical user interface, Auto Dock Tools (ADT) installed on Windows 7. The ligands geometries were optimized using Open Babel and used for docking. ADT was used for the preparation of ligands for docking by adding the charges to the optimized files. Information about co-crystallised PDE7 was obtained from the RCSB protein data bank and after evaluating a number of entries, best ligand bound complex (PDB entry: 4PM0) was selected by analyzing the protein with the highest resolution. The PDB file of PDE7 was edited with the help of molecular graphics tool PyMOL (The PyMOL Molecular Graphics System, Version 1.8 Schrödinger, LLC), α-chain was removed together with complexed inhibitor, all water molecules and all non-interacting ions were also removed. ADT was used for protein preparation and conversion of PDB files to PDBQT files. All the polar hydrogen atoms were added to the macromolecule. The grid parameters were calculated using “Grid” in ADT and the grid parameter file containing all information regarding grid coordinates (-42.323, 15.061 and 3.664 for x, y and z respectively), grid size (40 × 40 × 40 for x, y and z respectively), protein and ligand was prepared and saved as “Conf. txt”. The accuracy of the docking protocol was determined by docking of the reference inhibitor in the active site of PDE7, and the resulting binding pose was compared with that of co-crystallized ligand. The optimized ligand molecules saved as PDBQT files were docked into the refined PDE7 model using AutoDock Vina. For each ligand, nine best poses were generated and scored using Auto Dock scoring functions. In the log file, the binding free energy (ΔG) was reported for each ligand. At the end of docking, ligands with the most favourable free energy of binding were selected. Lower is the value; higher is the interaction and thus stability of the ligand-protein complex. The H-bond interactions, hydrophobic interactions etc. were analyzed further for the docked poses of all the ligands using PyMOL and best poses in the binding site were selected for further analysis. Animals: Wistar rats (150 - 250 g) were purchased from the disease free Animal House, Lala Lajpat Rai University of Veterinary and Animal Sciences, Hisar (India). The animals were housed in standard polypropylene cages (three rats/cage) and maintained at controlled room temperature (22 ± 2 °C) and humidity (55 ± 5%) with 12:12 hr light and dark cycle. All the rats were provided with commercially available rat normal pellet diet (Ashirwad Feeds) and water ad libitum, prior to the dietary manipulation. The experimental protocol was approved by Institutional Animals Ethics Committee and animal care was taken as per the guidelines of Committee for the Purpose of Control and Supervision of Experiments on Animals (CPCSEA), Govt. of India (Approval No. JCDMCOP/IAEC/07/15/29). Anti-inflammatory activity: The anti-inflammatory activity of the newly synthesized compounds was evaluated by using carrageen an induced rat paw edema method using ibuprofen as a standard anti-inflammatory drug. Rats were divided into control, standard and different test groups comprising of three rats in each group. Animals were fasted overnight with free access to water before experiment. The test groups were administered with selected synthesized compounds at a dose of 100 mg/kg and the standard group with ibuprofen at a dose of 100 mg/kg orally in 2% Tween 80, 1 hr before infusion of carrageen an. The control group received only vehicle. Acute edema was induced in the hind paw of rats by the injection of freshly prepared carrageenan in distilled water (0.1 ml). Edema was determined immediately and at 60, 120 and 180 min after the injection using a mercury plethysmometer. Mean difference in paw volume was measured and % inhibition of paw edema was calculated. The synthesis of designed substituted triazole derivatives was carried out as demonstrated by Scheme 1. The triazole derivatives were synthesized by reacting aromatic acids with amidine in presence of suitable coupling reagent to form acylamidine intermediates followed by reaction with the respective phenylhydrazines. TLC was performed at each and every synthetic step to check the purity of the compounds. The yield of synthesized compounds was appreciable and their physicochemical characteristics are presented in Table 1. The consistent FTIR and 1H-NMR spectra supported synthesis as well as purity of synthesized compounds. Scheme 1: Synthetic route followed for the synthesis of substituted triazole derivatives (1 - 15). Reagents and conditions: (a) HATU/HBTU, DMF, DIPEA, 25 °C, stirring, 2 - 18 hrs; (b) acetic acid, 80 °C, 1 - 3 hrs, ethyl acetate, sodium bicarbonate. Table 1: Physicochemical properties, docking score of best-docked poses and molecular properties of synthesized compounds (1 - 15). #Log P, HBA, HBD, and Mol. Wt., were calculated by Marvin tools of Marvin Sketch v5.5; *TLC mobile phase: n-hexane: ethyl acetate (7:3). The 1H-NMR spectra of the synthesized compounds showed the signal for the NH proton around δ 10 ppm confirming the presence of indole ring in the structure of compound 1. In the 1H-NMR spectra of synthesized triazole derivatives, a doublet signal was present around δ 7.50 ppm for aromatic protons indicating the presence of bromine group at para position of phenyl ring in the structure of compounds 1 and 4. The 1H-NMR spectra of compounds 11 and 13 showed the doublet signal for aromatic protons which revealed that it is derived from para substituted bromine around δ 8.00 ppm. The presence of doublet signal for two protons at δ 7.96 and 6.66 ppm for C3 and C5 and one triplet signal for one proton at δ 6.68 ppm for C4 confirmed the presence of furan substituted ring at the C5 position of the triazole ring in the structure of compound 4. In 1H-NMR spectrum, the one singlet signal for one proton at around δ 3.50 ppm revealed the presence of a methyl group substituted at triazole ring in the structure of compounds 13 and 14. The presence of doublet signal for two protons at δ 7.74 - 7.77 and 6.68 ppm for C3 and C5 and one triplet signal for one proton at δ 6.73 ppm for C4 confirmed the presence of thiophene substituted ring at the C5 position of the triazole ring in the structure of compound 14. The FTIR spectra of the compounds revealed absorption bands in the regions 1640 - 1690 cm-1 and 1000 - 1350 cm-1 corresponding to C=N stretching and C-N stretching bands because of ring closure indicating the presence of triazole ring in the synthesized compounds. The IR spectra of the synthesized compounds contained C-H stretching above 3000 cm-1 and C=C stretching (1450 - 1670 cm-1) indicating the presence of aromatic groups. Presence of-CH bending at above 1350 cm-1 in the IR spectrum of synthesized compounds confirmed the presence of-CH3 groups in its structure. The IR spectra of compounds 1 and 3 showed stretching at 561 cm-1 and 565 cm-1 which depicted the presence of bromo substituted phenyl ring in its structure. Presence of –NO2 asymmetric and symmetric stretching at 1485 cm-1 and 1382 cm-1 respectively supported the presence of nitro group in the structure of compound 5. IR spectra of compounds 7 and 12 showed the asymmetric stretching at 709 cm-1and 752 cm-1 indicating the presence of chloro substituted phenyl ring. Presence of fluoro substituted phenyl ring was confirmed by the stretching at 1109 cm-1 and 1149 cm-1 in the structure of compounds 8 and 10. Presence of furan ring was confirmed by -CO stretching above 1200 cm-1 in the IR spectrum of compound 15. In silico docking studies were carried out to evaluate the affinity and binding interactions of synthesized molecules (1 - 15) in the active site of PDE7 (PDB entry: 4PM0) using AutoDock Vina and the graphical user interface, ADT installed on Windows 7. For validating the docking protocol, the co-crystallized ligand 2-(cyclopentylamino)-3-ethyl-7-ethynylthieno[ 3,2-d]pyrimidin-4(3H)-one was docked into the active site of PDE7 and the resulting binding pose was compared with that of co-crystallized inhibitor. 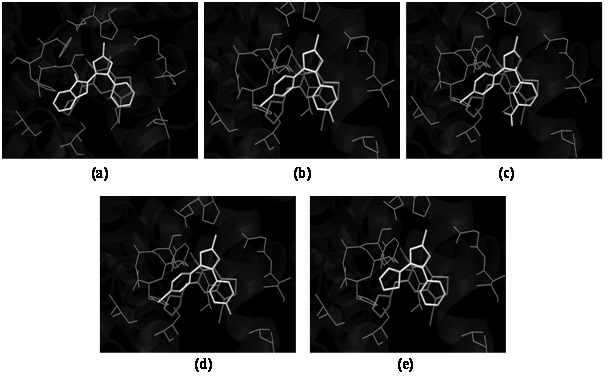 The docked compound was found to have a similar binding pattern and superposition to that of co-crystallized inhibitor validating the docking protocol (binding free energy was -7.9 kcal/mol). All the 15 synthesized compounds were docked in the active site of PDE7 protein. The compounds 2, 3, 5, 10, and 14 showed appreciable binding to the binding site as determined by analyzing their bonding interactions in terms of H-bond, hydrophobic interactions and binding free energy (ΔG) of the selected best-docked poses (Table 1). For other molecules, the docking algorithm produced a different binding pattern and molecules were randomly oriented in the binding site. On the basis of their lowest binding free energy and docking interaction in the binding site, compound 2, 3, 5, 10, and 14 were further analyzed in details by PyMOL. The overlays of the selected compounds (2, 3, 5, 10, and 14) and H-bond interactions were studied with the PDB Ligand 4PM0 and are shown in Figures 1and 2. The overlay of the selected compounds with the PDB Ligand 4PM0 showed that the compounds 2, 3, 5, 10, and 14 had the similar binding pattern in the binding site of the protein as that of the PDB Ligand 4PM0 and thus produced similar type of binding interactions as that of co-crystallized ligand. The overlays of selected compounds with PDB Ligand 4PM0 helped us in predicting that the selected synthesized triazole derivatives could act as potent PDE7 inhibitors. Figure 1: Overlay of docked pose for compounds 2 (a), 3 (b), 5 (c), 10 (d) and 14 (e) and PDB ligand of 4PM0 in binding site. The docking studies were performed to identify some potential molecules having anti-inflammatory activity and compounds 2, 3, 5, 10, and 14 were found to have appreciable interactions with PDE7 enzyme and were selected for the in vivo anti-inflammatory activity. The selected compounds 2, 3, 5, 10, and 14 were evaluated for the in vivo anti-inflammatory activity using carrageen an induced paw edema method using ibuprofen as standard anti-inflammatory drug. The results of anti-inflammatory activity (Figure 3) indicated that compounds 2 and 3 displayed appreciable inhibition of paw edema compared to the standard anti-inflammatory drug (ibuprofen), while compound 5 displayed very low activity and compounds 10 and 14 displayed moderate activity. Among the selected compounds evaluated for anti-inflammatory activity, compound 3 was found to be highly active with approximately 80% inhibition of paw edema. The results of anti-inflammatory activity indicated that substitution with electron withdrawing group like -F, -Br, etc. at para position leads to increased anti-inflammatory activity which can be seen from the anti-inflammatory activity of compounds 3 and 10. These anti-inflammatory activity results were in concordance with the results obtained in case of compounds with phenyl substitution bearing electron withdrawing groups like -F, -Cl, -Br, -OH, -OCH3, -NO2 at para position[19-21]. Substitution with electron withdrawing group viz. -NO2 at meta position resulted in decreased anti-inflammatory activity as seen in case of compound 5. Replacement of phenyl ring with heteroaromatic ring resulted in decreased activity as seen from the anti-inflammatory activity of compounds 2 and 14. Figure 2: Docked pose for compounds 2 (a), 3 (b), 5 (c), 10 (d) and 14 (e) showing H-bond interactions in the binding site of PDE7 protein. Figure 3: Anti-inflammatory activity (% inhibition of paw edema) of selected molecules. All the values are mean of 03 measurements ± SE. In conclusion, some novel substituted triazole derivatives were synthesized, characterized and evaluated as anti-inflammatory agents with an aim of targeting PDE7 enzyme. TLC was performed at each and every synthetic step to check the purity of the compounds. Molecular docking was performed for the synthesized triazole derivatives to evaluate the affinity and binding interactions of synthesized molecules and compounds 2, 3, 5, 10, and 14 were selected for in vivo anti-inflammatory activity. Selected molecules were evaluated for anti-inflammatory activity using carrageen an induced rat paw edema method using ibuprofen as the standard anti-inflammatory drug. The results of anti-inflammatory study indicated that compounds 2 and 3 displayed appreciable inhibition of paw edema with compound 3 showing higher anti-inflammatory activity with approximately 80% inhibition of paw edema. The results of in vivo studies were found to be in accordance with that of in silico docking results. The molecular properties of these new derivatives also were found to observe the Lipinski’s rule of five. These newly designed molecules could act as initial hit molecules for the design of effective PDE7 inhibitors for the potential treatment of inflammatory disorders. 1. Boswell-Smith, V., Spina, D., Page, C.P. Phosphodiesterase inhibitors. (2006) Br J Pharmacol 147: S252-S257. 2. Omori, K., Kotera, J. Overview of PDEs and their regulation. (2007) Circ Res 100(3): 309-327. 3. Lugnier, C. Cyclic nucleotide phosphodiesterase (PDE) super family: a new target for the development of specific therapeutic agents. (2006) Pharmacol Ther 109(3): 366-398. 4. Moore, A.R., Willoughby, D.A. The role of cAMP regulation in controlling inflammation. (1995) Clin Exp Immunol 101(3): 387-389. 5. Baumer, W., Hoppmann, J., Rundfeldt, C., et al. Highly selective phosphodiesterase 4 inhibitors for the treatment of allergic skin diseases and psoriasis. (2007) Inflamm Aller Drug Tar 6(1): 17-26. 6. Souness, J.E., Aldous, D., Sargent, C. Immunosuppressive and anti-inflammatory effects of cyclic AMP phosphodiesterase (PDE) type 4 inhibitors. (2000) Immunopharmacol 47(2-3): 127-162. 7. Castro, A., Jerez, M.J., Gil, C., et al. Cyclic nucleotide phosphodiesterases and their role in immunomodulatory responses: advances in the development of specific phosphodiesterase inhibitors. (2005) Med Res Rev. 25(2): 229-244. 8. Gil, C., Campillo, N.E., Perez, D.I., et al. PDE7 inhibitors as new drugs for neurological and inflammatory disorders. (2008) Expert Opin Ther Pat 18(10): 1127-1139. 9. Redondo, M., Brea, J., Perez, D.I., et al. Effect of phosphodiesterase 7 (PDE7) inhibitors in experimental autoimmune encephalomyelitis mice. Discovery of a new chemically diverse family of compounds. (2012) J Med Chem 55(7): 3274-3284. 10. Smith, S.J., Cieslinski, L.B., Newton, R., et al. Discovery of BRL 50481 [3-(N,N-dimethylsulfonamido)-4-methyl-nitrobenzene], a selective inhibitor of phosphodiesterase 7: in vitro studies in human monocytes, lung macrophages, and CD8+ T-lymphocytes. (2004) Mol Pharmacol 66(6): 1679-1689. 11. Christensen, I., Miskovicova, H., Porvaznik, I., et al. Selective inhibition of phosphodiesterase 7 (PDE7) by BRL50481 in healthy and ovalbumin-sensitized guinea pigs. (2012) Acta Medica Martiniana 12(1): 16-23. 12. Castro A, Abasolo MI, Gil C, Segarra V, Martinez A. CoMFA of benzyl derivatives of 2,1,3-benzo and benzothieno[3,2-a]thiadiazine 2,2-dioxides: clues for the design of phosphodiesterase 7 inhibitors. (2001) Eur J Med Chem 36(4): 333-338. 13. Sanchez, A.I., Martínez-Barrasa, V., Burgos, C., et al. Synthesis and evaluation of quinazoline derivatives as phosphodiesterase 7 inhibitors. (2013) Bioorg Med Chem 21(8): 2370-2378. 14. Perez, D.I., Pistolozzi, M., Palomo, V., et al. 5-Imino-1,2-4-thiadiazoles and quinazolines derivatives as glycogen synthase kinase 3β (GSK-3β) and phosphodiesterase 7 (PDE7) inhibitors: determination of blood-brain barrier penetration and binding to human serum albumin. (2012) Eur J Pharm Sci 45(5) : 677-684. 15. Pitts, W.J., Vaccaro, W., Huynh, T., et al. Identification of purine inhibitors of phosphodiesterase 7 (PDE7). (2004) Bioorg Med Chem Lett 14(11): 2955-2958. 16. Guo, J., Watson, A., Kempson, J., et al. Identification of potent pyrimidine inhibitors of phosphodiesterase 7 (PDE7) and their ability to inhibit T cell proliferation. (2009) Bioorg Med Chem Lett 19(7): 1935-1938. 17. Banerjee, A., Yadav, P.S., Bajpai, M., et al. Isothiazole and isoxazole fused pyrimidones as PDE7 inhibitors: SAR and pharmacokinetic evaluation. (2012) Bioorg Med Chem Lett 22(9): 3223-3228. 18. Gewald, R., Rueger, C., Grunwald, C., et al. Synthesis and structure-activity relationship studies of dihydronaphthyridinediones as a novel structural class of potent and selective PDE7 inhibitors. (2011) Bioorg Med Chem Lett 21(22): 6652-6656. 19. Datar, P. QSAR and synthesis of a novel biphenyl carboxamide analogue for analgesic activity. (2015) Mod Chem Appl 3: 148. 20. Puratchikody, A., Doble, M. Antinociceptive and antiinflammatory activities and QSAR studies on 2-substituted-4,5-diphenyl-1H-imidazoles. (2007) Bioorg Med Chem. 15(2): 1083-1090. 21. Shah, U.A., Wagh, N.K., Deokar, H.S., et al. 3D-QSAR of biphenyl analogues as anti-inflammatory agents by genetic function approximation (GFA) [part-II]. (2010) Int J Pharma Bio Sci 1(4):512-522. 22. Castanedo, G.M., Seng, P.S., Blaquiere, N., et al. Rapid synthesis of 1,3,5-substituted 1,2,4-triazoles from carboxylic acids, amidines, and hydrazines. (2011) J Org Chem 76(4): 1177-1179. 23. Trott, O., Olson, A.J. AutoDock Vina: improving the speed and accuracy of docking with a new scoring function, efficient optimization and multithreading. (2010) J Comput Chem 31(2): 455-461. 24. Morris, G.M., Huey, R., Lindstrom, W., et al. Autodock4 and AutoDockTools4: automated docking with selective receptor flexibility. (2009) J Comput Chem 30(16): 2785-2791. 25. O'Boyle, N.M., Banck, M., James, C.A., et al. Open Babel: an open chemical toolbox. (2011) J Chem inform 3: 33. 26. Goyal, P.K., Bhandari, A., Rana, A.C., et al. Synthesis of some 3-substituted-4H-1,2,4-triazole derivatives with potent anti-inflammatory activity. (2010) Asian J Pharm Clin Res 3(3): 244-246.